The Scott sisters, Elizabeth '28, Helen '30, and Beatrice '33, were raised in China by their parents (Dr. and Mrs. Charles E. Scott) who were missionaries. They all returned to China as missionaries, themselves. Helen Scott Mahy returned to China in 1935 under the Board of Foreign Missions of the Presbyterian Church. Alumnae Quarterly (AQ) May 1935: "Helen Scott Mahy and her husband have been assigned by the Board of Foreign Missions of the Presbyterian Church to the China Council for suggested location at Shantung." AQ August 1935: "Helen Scott Mahy and her husband have sailed for China under appointment of the Presbyterian Board of Foreign Missions." 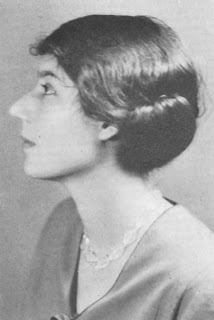 AQ February 1938: "Word has been received from Seattle that Helen Scott Mahy is safe and well." AQ Frebruary 1942: "The Gordon Mahy family (Helen Scott), with Betty Scott Stam's daughter, Helen Priscilla, are at Montreat, N.C. until such time as they may be able to return to China." AQ August 1945: "Margaret Mahy Van Dyke spent two weeks with her brother and his wife, Helen Scott Mahy, Ted Stevenson, husband of Bunny (Beatrice) Scott, arrived there for a family reunion after three and one-half years as a prisoner of the Japs in Manila." AQ May 1946: "Helen Scott Mahy's husband left for China in January. Helen and the children will join him during the summer." AQ May 1949: "Gordon Mahy has returned recently from a trip into Chinese Communist Territory. The Mahy's feel they will continue to stay in Tsingtao as long as they can help their Chinese Church and friends, but with Communist military successes and U.S. Navy evacuations, they may send the three older children to school in America. Don Mahy, is now a high school junior, and is six and a half feet tall. The other Mahy children are well and growing - typical American children as yours and mine." AQ August 1950: "Gordon and Helen Scott Mahy and family are now in the Philippine Islands. Helen is teaching there and writes that the family is well."